Free living wombats do not cope well in captivity as they stress and with an already suppressed immune system they usually die within days, so bringing them into care is not a realistic option. The fact that wombats are nocturnal and live underground means treatment is difficult but not impossible. 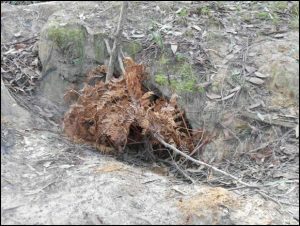 Many wombats live on private land so their health and well being is dependent on the landowners concern and interest. 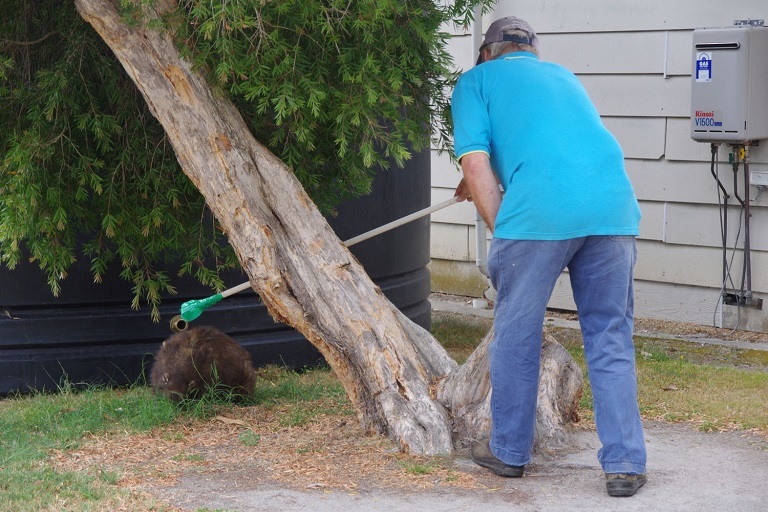 There is now a simple way of treating wombats and preventing mange from spreading. 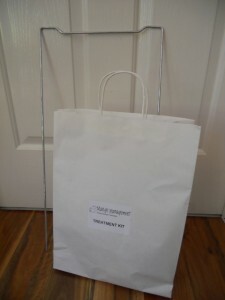 Information leaflet, wire frame, burrow flap, cydectin, syringe, rubber gloves, scoop, cable ties. Mange Management recommends you contact us to confirm mange diagnosis and correct Cydectin® dosage for treatment. Once weekly for 8 weeks – then 4 fortnightly treatments. 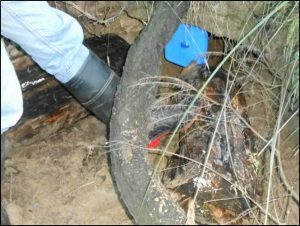 Continued fortnightly or monthly treatments are a good idea if the infestation has been severe and there is more than one wombat involved. The Cydectin® will work as a preventative and can be phased out over a period of months when mange is no longer present in the area. If the wombat appears to be deaf and blind and is approachable, it will need a stronger dose. (Contact for advice) Hearing and sight are the first things to return as the wombat starts to recover, this is usually evident after a few weeks. Photos of the wombat at the start of treatment and follow up photos are appreciated so we can assess the wombats progress through the treatment process and adjust the dose rate accordingly. Sometimes supportive treatment may be needed if the wombat develops open wounds as a result of the scabs being scratched off. This is usually superficial and heals within a couple of days. In the summer when flies are prevalent and annoying the wombat Troy Chloromide can be used to stop wounds becoming flyblown. This is an antiseptic which may help the wound to heal and also repels flies. Other products that may assist are Cetrigen and Flints Lotion (These products are usually available at Produce Stores). The weekly treatment dose rate of Cydectin® pour on for a wombat with mange is 1 ml per 10 kg body weight. The dosage recommended for an adult sick mangy wombat is 5ml, this allows for some spillage. Based on the mite life cycle, free living wombats need to be treated weekly for 8 weeks, then a further 4 fortnightly treatments. 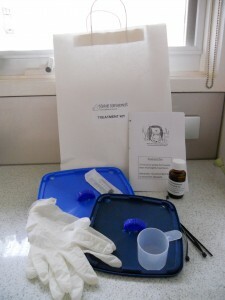 Making a total of 12 treatments. There is no need to catch or touch the wombat at any stage. If the wombat is approachable we suggest treating with a pole and scoop device. This device is simply a plastic scoop found in washing detergent or similar which is taped to a long pole (maybe an old broom handle). A wombat that is approachable usually indicates a more severely infested wombat which will need a stronger dose. See above Severe mange – Recommended dose. 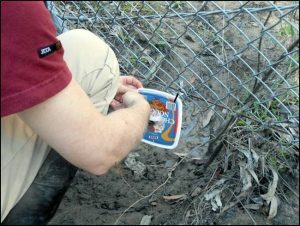 Cydectin® is being administered via a pole and scoop straight onto the wombats back. 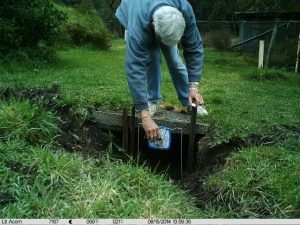 The Burrow Flap is an easy way to treat wombats with mange as the flaps can be placed and monitored during daylight hours and without disturbing the wombat. 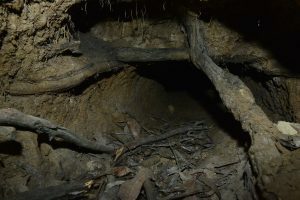 There is no need to catch or touch the wombat as it self medicates when leaving or returning to it’s burrow, this ensures no stress for the wombat. Frame positioned at the entrance to the burrow. Make sure the cable ties are pulled tight to stop the flap from moving around on the wire frame but be sure the flap can move forward & back without disturbance. 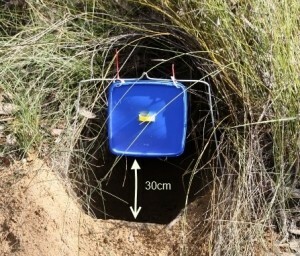 Wire frame can also be pushed into the top of burrow. Unfortunately, all burrows aren’t the perfect size to install a burrow flap. So decide on the best position to place the flap making sure it can swing freely and then …….. 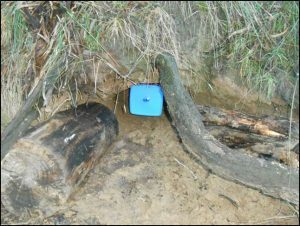 If the entrance is too wide it may be necessary to make it smaller by blocking off the sides with logs to encourage the wombat to push under the flap. 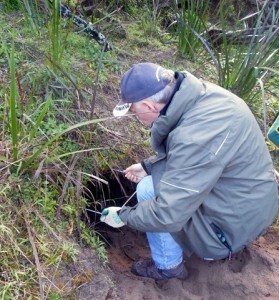 FINISHED ….Burrow entrance modified encouraging wombat to activate the burrow flap. 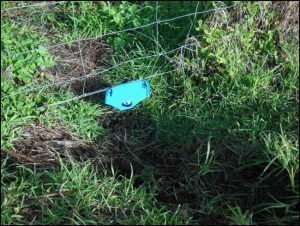 Burrow flaps can also be set up on well worn tracks under fences. The burrow flap may need to be shortened to allow easier access (as above). 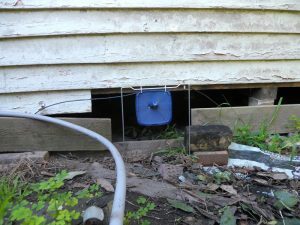 Stakes can be installed on either side of the frame to encourage the wombat to walk under the flap. 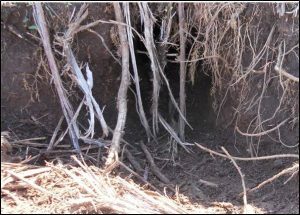 If you are uncertain whether a burrow is active, try covering the entrance with some bracken or sticks. 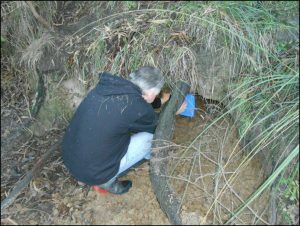 This is not invasive for the wombat and these will be pushed aside if the burrow is being used. Watch how the Cydectin pours down the centre of the wombats back where it will be easily absorbed. 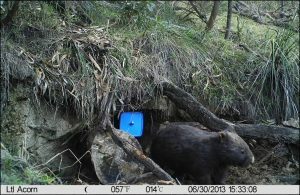 Wombat self-medicating using a Burrow Flap set up out side burrow.